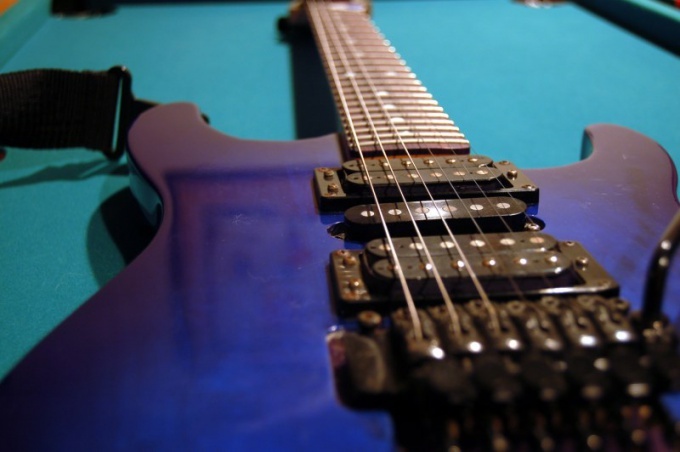 Tuning electric guitars, unlike acoustic, is more delicate and time consuming procedure. To get the tool of excellent work, in addition to adjust the sound you want to adjust the scale, the height of the strings, to adjust the camber of the fretboard and the distance from the strings to the pickups. Adjust the sound of an electric guitar using an online tuner or special programs: Pitch Perfect Tuner Gutar pro Tune It! AP Guitar Tuner, Guitar Rig, GCH-Guitar Tuner. To adjust yourself, trust your music ear. Tune your guitar in standard order, starting with the first control the sound of the string: it should correspond to the note "Mi" on the piano or the sound of the first string to another already tuned guitar. In unison with the open first string should sound the second, sandwiched on the fifth fret. The sound of the third, sandwiched on the fourth fret, the strings should be the same as the second sound of the open strings. Fourth, fifth and sixth string, sandwiched on the fifth fret must be sound in unison with the third, fourth and fifth open. Adjust the scale of the guitar using the tuner. Rotate the bolt located on the tailpiece, adjust the guitar so that clamped on the twelfth fret string to sound an octave higher than the open. Use harmonics to set the scale by ear. Increase the size of the scale in that case, if the note at the twelfth fret will be higher than the notes of the open strings. In the reverse situation requires the reduction of scale. Adjust the deflection of the neck of a guitar, holding down the sixth string at the first and last fret. Check if the distance from the eighth fret to the strings was 0.2 - 0.3 mm. make Sure the distance from the strings to the upper surface of the seventeenth fret is 1.6 - 2.4 mm. on the strings from the first to the third and 2 - 2.8 mm. on the strings from the fourth to the sixth. Rotate the bolts by which the pickup is attached to the housing to adjust the distance from the pickups to the strings. The distance from the transducer to the thick strings should be longer than the same distance from the thin strings. If the sensor is too close, it will zadavalsya strings, but if too far, the sound will be quiet.